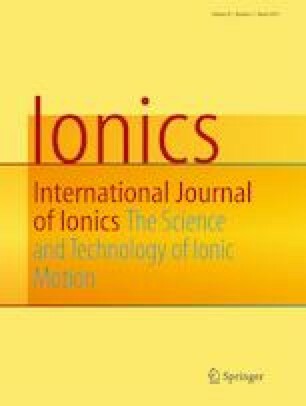 In this article, highly Na+ ion conducting glass samples based on Na3+x[CrxTi2-x(PO4)3] (x = 0, 0.25, 0.5, and 0.75 mol%) (NCTPx) system was prepared via melt quenching technique. The as-formed precursor glasses were transformed into glass-ceramics by heat treating at and above Tc for different time schedules. Powder XRD indicates the formation of NASICON type phase (Na3Ti2(PO4)3) which is known for its higher stability and ionic conductivity. This phase is precipitated due to the partial replacement of tetrahedral Ti4+ ions by trivalent Cr3+ ions in the NCTP glass-ceramic network. The NCTP0.5 glass-ceramic sample heat treated at 1066 K for 9 h exhibited best bulk conductivity (σ = 8.52 × 10−4 S/cm) and minimum activation energy (0.448 eV). For Tc > 1066 K, impure phases such as Cr2O3 and NaCrP2O7 were precipitated along the grain boundaries which resist the migration of Na+ ions between the grains. The best conducting NCTP0.5 sample after crystallization (glass-ceramic) exhibited good chemical stability in ambient atmosphere for 60 days. The authors thank Dr. K.S Rama Rao, Sr. Principal Scientist, CSIR-Indian Institute of Chemical Technology, Hyderabad, India, for kindly extending the facility to acquire SEM micrographs. Financial support for this work, provided by the Board of Research in Nuclear Sciences (BRNS), Department of Atomic Energy (DAE), and Govt. of India, Grant No: 34/14/06/2018-BRNS/34082, is gratefully acknowledged.